The Oklahoma City Thunder needed to make adjustments going into Game 2 of the Western Conference Finals against the San Antonio Spurs. Adjustments they made, managing 111 points. Yet they still lost, allowing 120 points. The Thunder can’t win the series if they give up that many, but it’s not just their defensive shortcoming. What we saw in the first three quarters from the San Antonio Spurs was a clinic on offense. 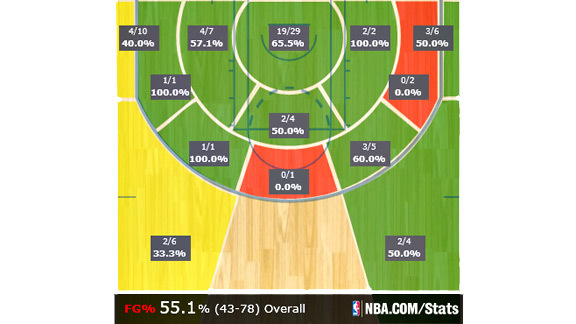 This is a set that the Spurs run for Tony Parker and Manu Ginobili very often, but rarely for Green. But Popovich knew he could get an early, open look for his struggling player, and ultimately Green scored 10 points on 10 shots, including two 3s — a vast improvement. 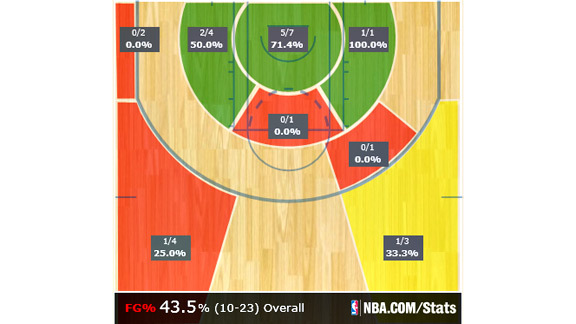 This has been a staple of the Spurs’ offense for the past two seasons. As opposed to Parker walking the ball up, he pushes it every time, and his bigs know to look for his outlet passes. If no one is open, Parker pulls back. But the majority of the time, the Spurs can get easy fast-break points like in the video above. A third integral part of the Spurs’ offense (for more than two years) has been the corner 3. If the defense sends help to take away layups, corner 3s are just as good of an option. They can rely on the corner 3 because of how well they routinely execute. The Spurs don’t make the pass into the corner after an assessment of all the options. Rather, they see the help defense by the basket and go for the corner instead, knowing there will be an open guy there. Westbrook has to focus on defense at all times, and he already is not the best off-ball defender (though he can be very good in stretches), which you can see here. He gets stuck on screens, and because their bigs aren’t the most mobile, they can’t help. As they prevented the Spurs from getting into the paint, the defenders in the corners could remain there, thus limiting corner 3s as well. If Parker did use the screen, they corralled him such that he couldn’t reset. The Spurs began relying on isolations, which is not as effective for them. Expect the Thunder to begin Game 3 with this defensive strategy. The Spurs will probably have prepared a counter, but Scott Brooks has to limit the amount of points the Spurs score, and this might be the way.